Young adult OYF attendees gather at the opening night reception. We are grateful to all of our Opportunity Youth Forum partners from across the country that gathered with us last month in Seattle/South King County to learn about the local work in the region and learnings from the entire OYF national network and partners. Thank you to all who participated: leaders from backbone organizations, representatives of school systems, institutions of higher education, private sector, community-based organizations, foundations, and youth leaders. Several young leaders from South King County joined us to discuss the incredible event and what it was like to share their city. With the convening bringing together a tremendous swell of young voices, Tori Felder, 24, hopes this translates to people valuing opportunity youth. Tevin Gladney, 23, urges convening attendees to continue keeping youth voices front and center. Pavielle Montes, 25, agrees, saying that strong national partnerships will help foster and strengthen local partnerships. We continue to stand in awe of the young leaders who took the stage (and the mic) to share their stories of resilience, courage, and power. Pavielle says she wishes for convening participants to recognize the tremendous resources available in Seattle/South King County and the crucial role that Reconnect to Opportunity (ReOpp) plays in youth re-engagement. Tevin said he was most proud to discuss ReOpp’s social media projects and hopes that other partners across the country can mirror this work. Tori says witnessing youth leaders Freda Crichton and Hikma Sherka take the stage to “share their truth on a platform” was inspiring and one of her favorite moments from the event. Tori says older attendees acknowledging the power of young leaders also was impactful to her. “We can all find strength in each other’s stories,” she says. Pavielle says learning about the history of the land from Muckleshoot Tribal elder Renee Rose Lozier Rojas was especially powerful. Renee relayed her knowledge of plants as well as stories from her native culture that have been passed down from generations. Renee’s niece, Cali, shared with participants cultural songs and dances. “It was a great example of the power of intergenerational relationships,” Pavielle says. 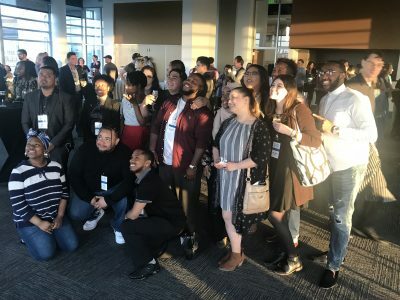 Given the success of the convening in Seattle/South King County, Tevin has high hopes for a future convening led by young leaders. He said after debriefing with other youth leaders, they are in agreement.